Your smile says so much about you. If it is discolored or embarrassing in any way, it can really set the tone for how you carry yourself as well as how others view you. Even if you are the most organized, well put together person, that first smile can make you seem less than appealing if your teeth are not pearly white and in good condition. Unfortunately, time and natural wear and tear can really wreak havoc on your pearly whites, leaving them stained and unsightly for everyone to look at. Rather than dealing with this "new smile," take advantage of professional teeth whitening or other simple restorations to get your bright white smile back. One of the largest advantages of coming into the office for professional teeth whitening rather than trying to do it on your own is the safety of the process. You never know the type of reaction your smile is going to have when you whiten your teeth at home. What if you over whiten them or you use the product wrong? You could wreck your smile even more. When you have professional whitening, we know exactly what your teeth can handle and how they will react to the process. 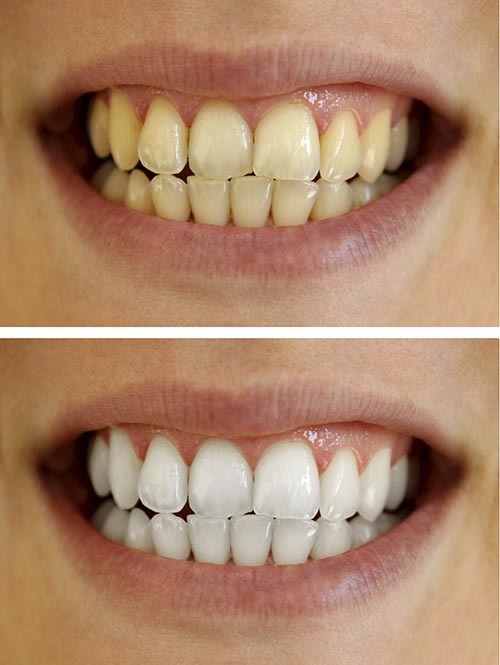 If we know that your stains will not benefit from whitening, we will provide other alternatives to fix your smile. The ultimate goal is to give you a smile that you love and will not be embarrassed to show others. Sometimes whitening your teeth at home can provide teeth that are overly sensitive and still discolored! If your stains are intrinsic, which means they are on the interior of your teeth, rather than the exterior, over-the-counter teeth whitening is not going to help. In these cases, you will likely need dental veneers or dental bonding, each of which do not involve changing the color of your teeth. These restorations actually lay over your existing enamel, literally covering up the discoloration that may have you hiding your smile. The restorations are simple to perform and are something we do on a daily basis. We have helped hundreds of patients love the appearance of their smile with veneers or dental bonding that look just like their surrounding teeth, which means no one is ever the wiser that anything is different! You will simply be amazed at the way you carry yourself once your teeth are no longer discolored or misshapen. There is something that transforms in our patients when they look in the mirror and see a beautiful smile staring back at them. That first impression that they were always afraid to make with others for fear of being judged based on their smile alone is no longer a worry. Just knowing that they could smile without fear was worth the weight in gold to these patients. Fixing your smile, whether it means a simple teeth whitening or a more in depth restoration, such as veneers or dental bonding can have a dramatic impact on your life. This does not mean only your dental health - it can impact your entire life. When you love your smile, you are more likely to be happy; be more social; and even have better physical health. Don't let your smile drag you down! Find out why you have discoloration or any other issues with your smile and how they can be fixed so that you too can carry yourself with pride! If you are unhappy with your smile, please call our office for a consultation today. We will get you back on the road to loving your smile again!